The Dalton hammered nickel bath sink is luxurious and functional. This individually handcrafted sink is made with durable nickel finish. The bold and innovative design offers more than just a sink; it is a work of art for your home. Featuring a maintenance-free finish and straightforward installation, a nickel sink from Sinkology is intended for everyday living and offers a lifetime warranty. The Tahoe sink features a unique squared design, generous size, and durable construction. Crafted from KOHLER enameled cast iron, this sink resists scratching, burning, and staining for years of beauty and reliable performance. This metal frame model has holes for faucets with 4-inch centers. Dalton 20-inch Drop-In Handcrafted Bathroom Sink in Hammered Nickel The Dalton hammered nickel bath sink is luxurious and functional. 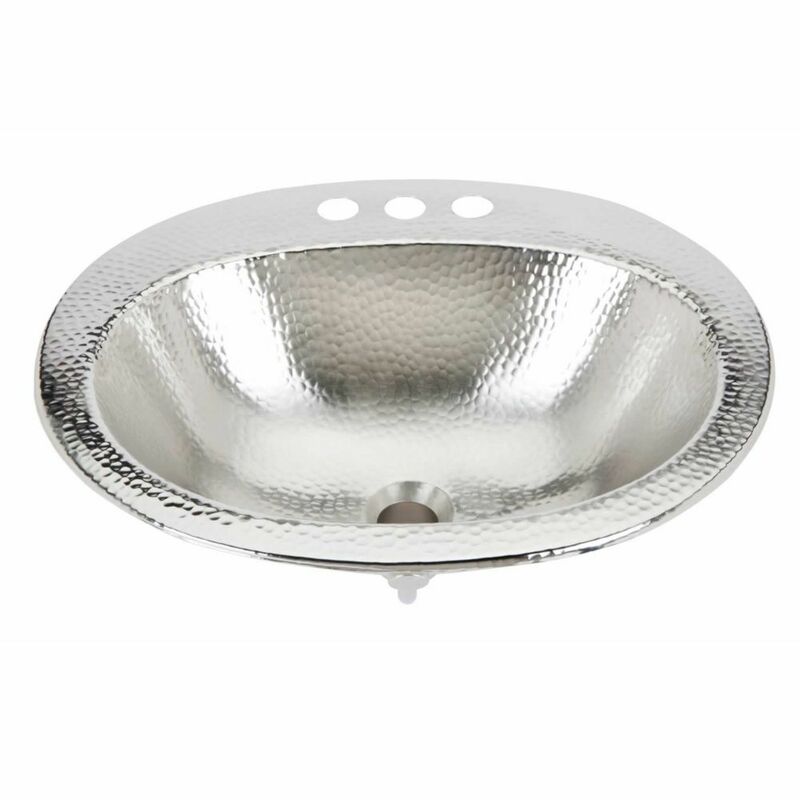 This individually handcrafted sink is made with durable nickel finish. The bold and innovative design offers more than just a sink; it is a work of art for your home. Featuring a maintenance-free finish and straightforward installation, a nickel sink from Sinkology is intended for everyday living and offers a lifetime warranty. Dalton 20-inch Drop-In Handcrafted Bathroom Sink in Hammered Nickel is rated 3.9 out of 5 by 25. Rated 4 out of 5 by Kaz from Looks good, easy to install and does what it's suppose to do. Looks good, easy to install and does what it's suppose to do. Rated 5 out of 5 by Rita from Absolutely love this sink. Everyone who has seen it... Absolutely love this sink. Everyone who has seen it lives it too. Our daughter said, “I covet that sink! !” Well made and easy to install. Rated 3 out of 5 by HomeDepotCustomer from Sink is beautiful however bowl is warped I currently have 50lbs of weight on it to hopefully get ... Sink is beautiful however bowl is warped I currently have 50lbs of weight on it to hopefully get it straight. Rated 3 out of 5 by AEP from Beautiful disaster I bought this sink for my bathroom remodel. It is absolutely beautiful until 4 months later when it stained. I have two permanent drip marks in my sink that I have tried everything to get rid of. I am so disappointed because it’s perfect otherwise. Rated 5 out of 5 by Barbara from Gorgeous! Outstanding! So glad I chose this sink!... Gorgeous! Outstanding! So glad I chose this sink! makes a statement in my bathroom! Rated 5 out of 5 by Amanda from I absolutely love this sink. It’s perfect for my... I absolutely love this sink. It’s perfect for my bathroom remodel. Rated 4 out of 5 by TonjaB from I really love the look of this sink! It's Very... I really love the look of this sink! It's Very unique. My Plummer had to switch out the pipes to install because this came with plastic pipes and I had copper. The only concern I have is the material seems thin and I'm wondering how it will hold up over time. But all and all I really like it!